Jamison Cottage Cutting Room Floor Photos | Hey, Girlfriend! A reader of Vintage Holiday magazine recently contacted Hey, Girlfriend! 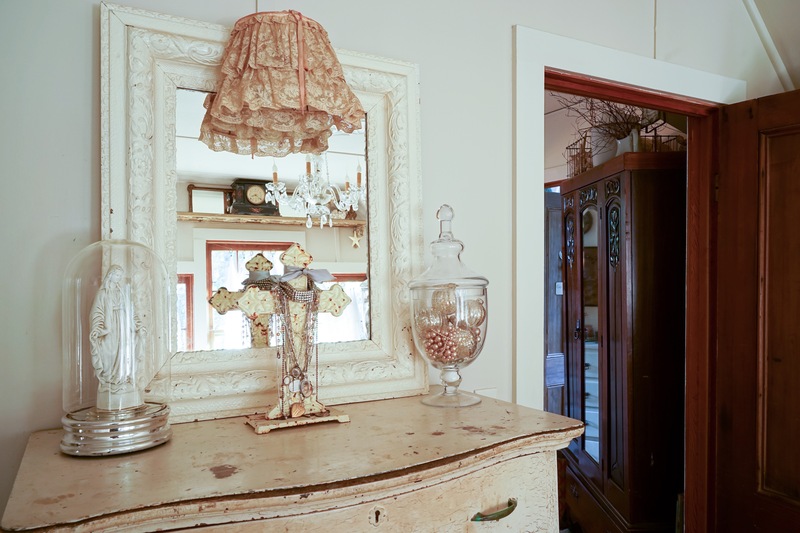 to ask for more photos of Jamison Cottage. She specifically asked for bathroom and master bedroom photos. I am including them below. I did not originally publish most of those photos because I was relying on natural light for the photography and many of them were too dark. 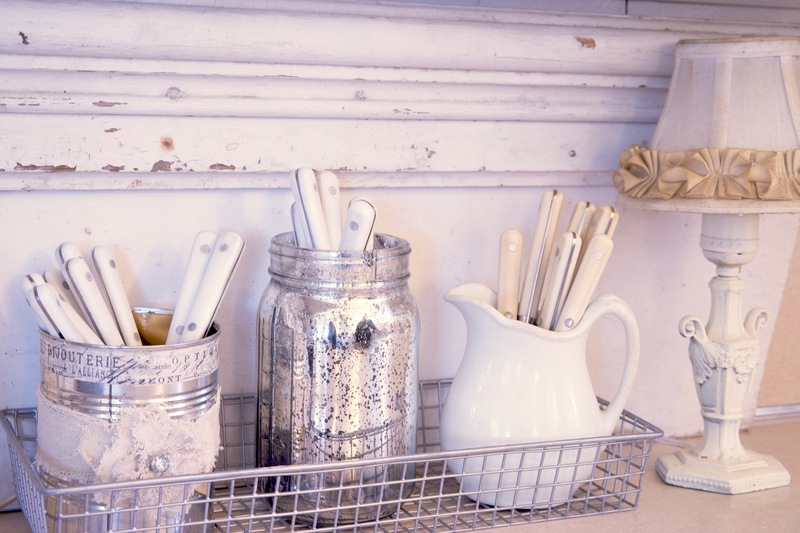 Jami stores her flatware in these creative containers: a tin can embellished with trim from a deconstructed object, a mason jar she made to look like mercury glass, and a cream pitcher. 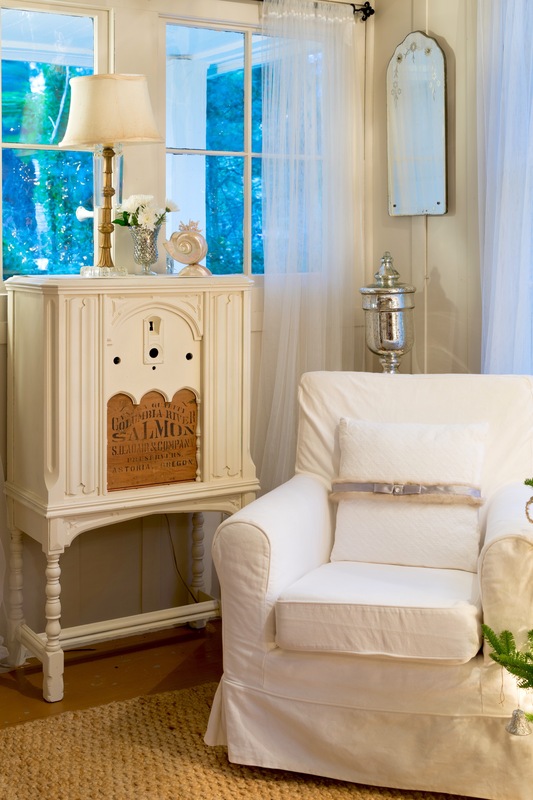 A few of Jami’s imaginative creations: a dressed up pillow fashioned from deconstructed clothing and a beautiful antique music cabinet coated in her favorite spray paint color HEIRLOOM WHITE. The board, covering the old speaker opening, is stenciled with an antique stencil from a nearby salmon cannery. 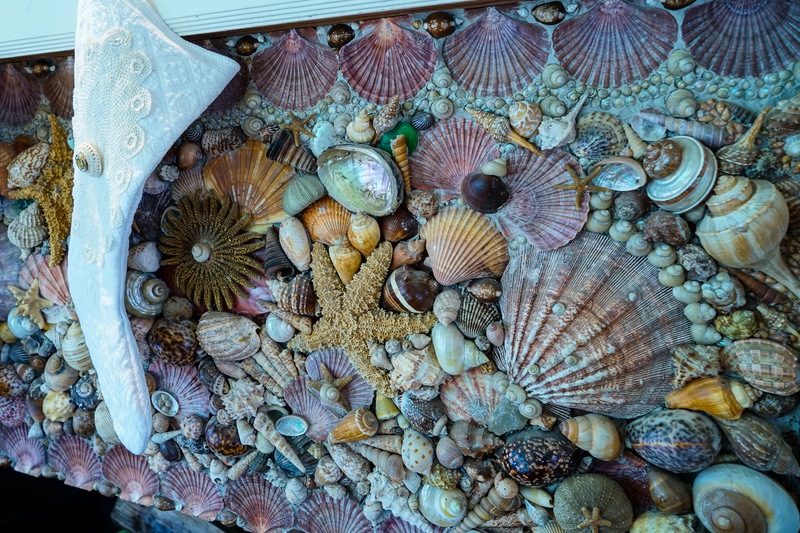 Joe, an art major, and Jami created the fireplace surround beginning with an idea and a shell collection bequeathed to them by a precious girlfriend. 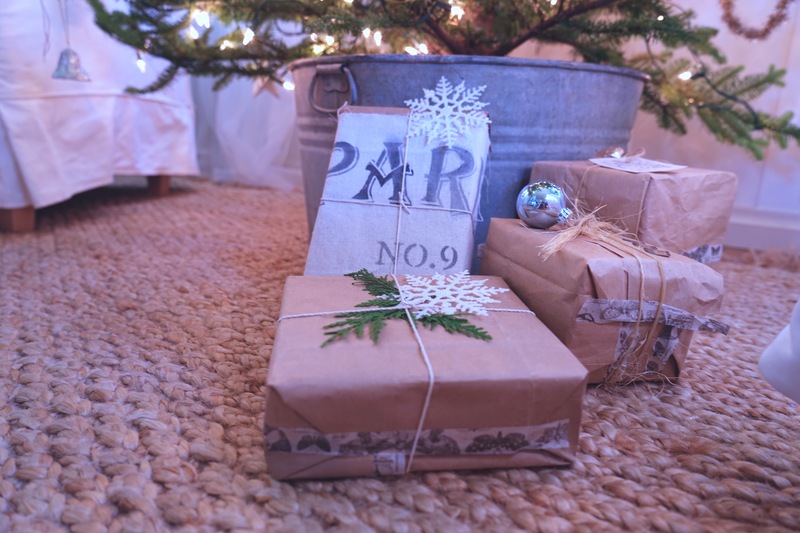 Gifts unpretentiously wrapped in recycled paper bags, Washi Tape, stenciled burlap, twine, fresh greens and Christmas ornaments. A tray of decanters. 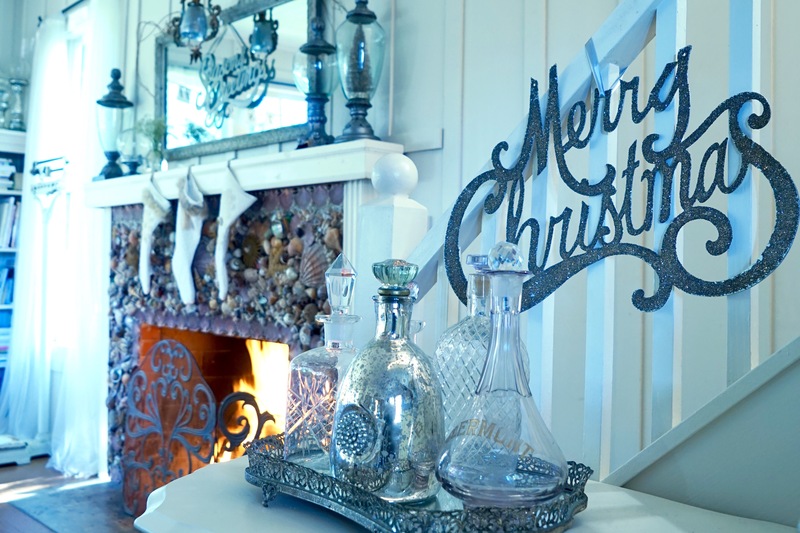 The mercury glass decanter has a glass antique door knob for a stopper. 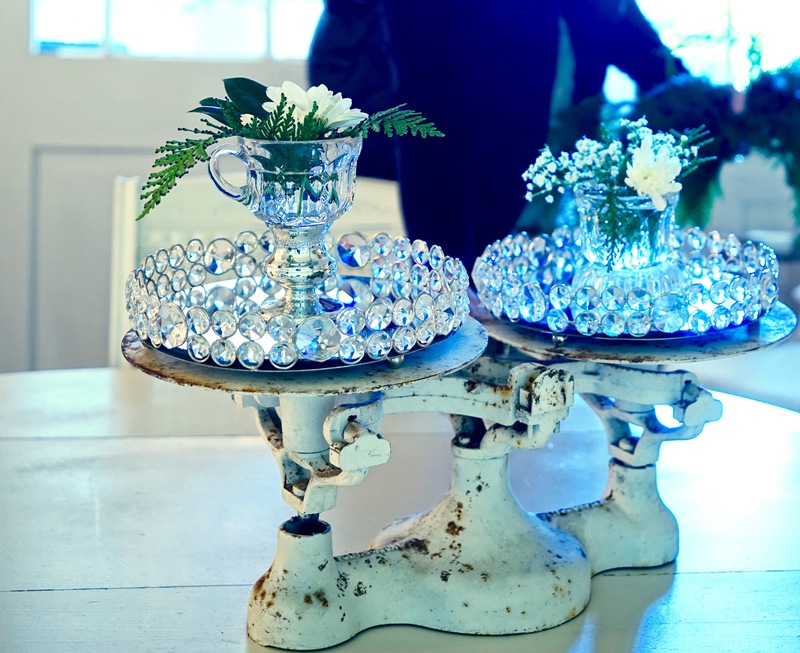 An old scale holds small round jeweled trays and glass cups with flowers. One cup is perched on top of a silver candle holder. 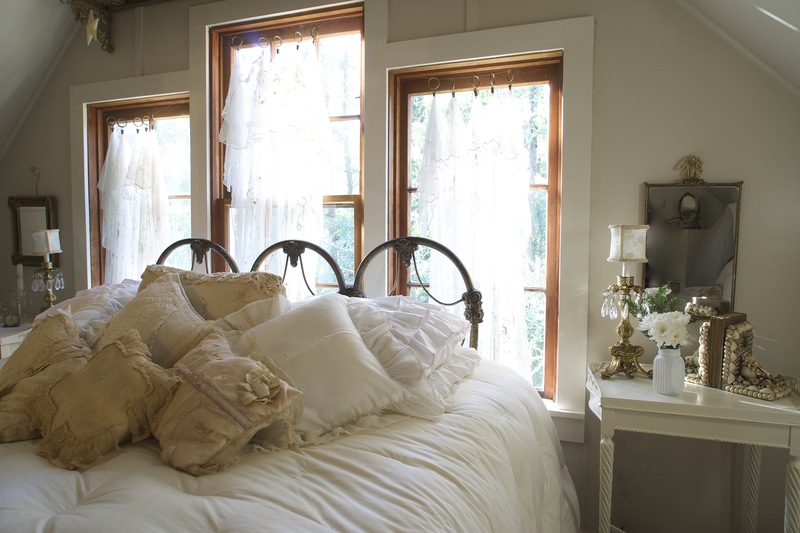 Antique lace, hung from wires that are nailed to window jams, creates ethereal window coverings in the master bedroom. A vintage headboard lamp clipped above a mirror casts a warm glow on the chest of drawers in the master bedroom at night. 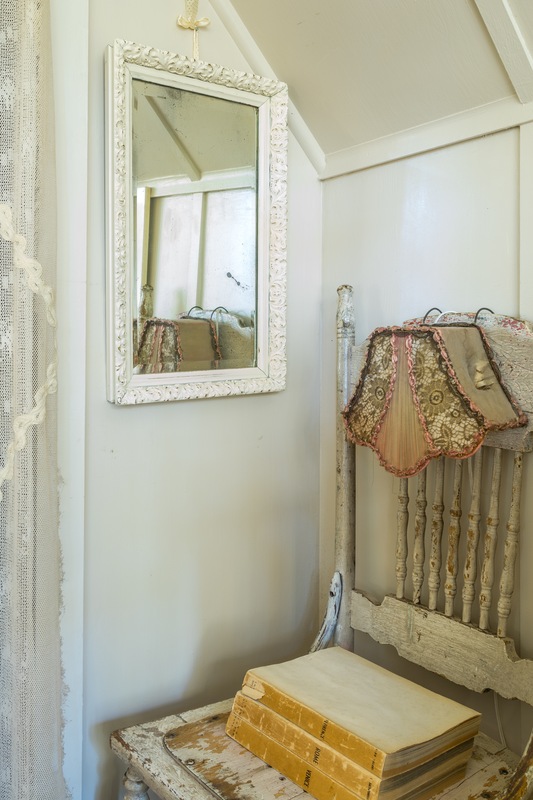 Another romantic vintage headboard lamp. This one is clipped to the back of a chair to light a corner of the master bedroom. This upstairs bathroom has a shower that is constructed with corrugated anodized steel walls and a concrete floor. 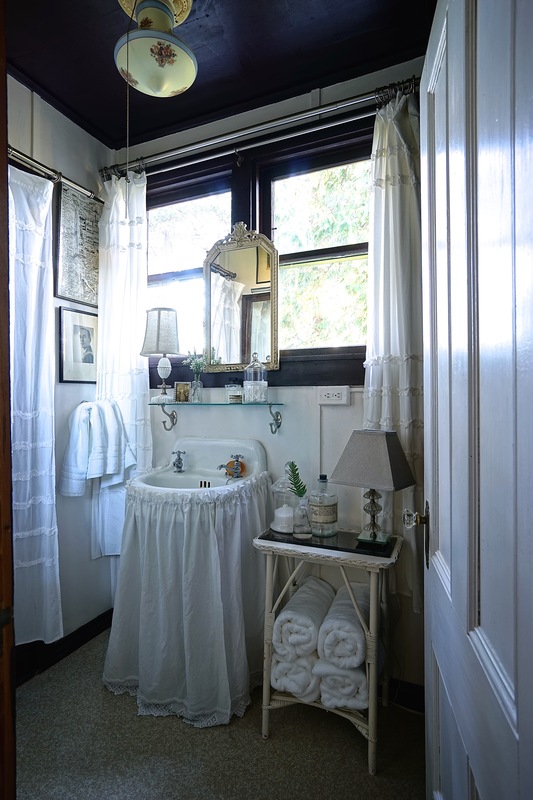 It feels modern, in a beach house sort of way, but it’s original to this 1920s edition. 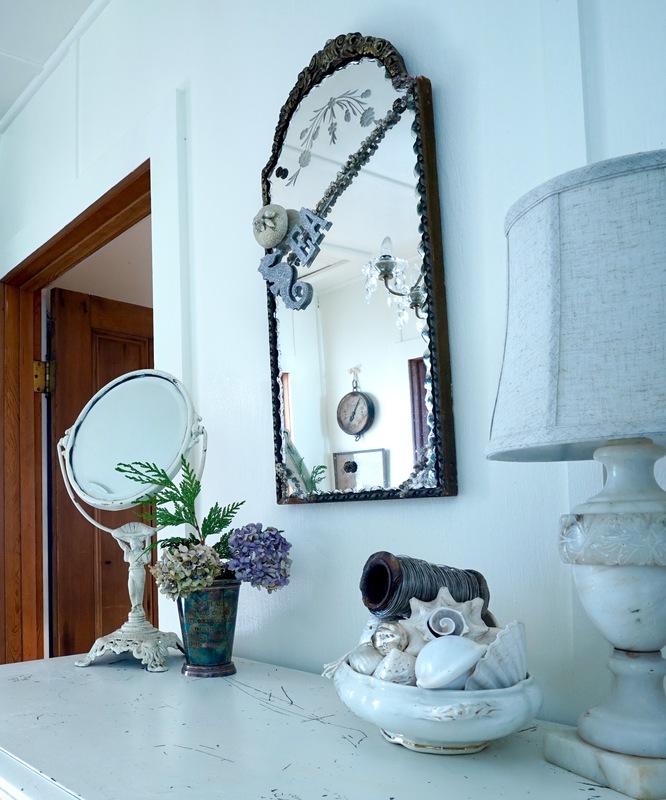 I love how Jami embellished this antique mirror in her upstairs hallway and I love that she put an antique spool of wire in this china bowl filled with pretty shells. I also adore the old silver cup that appears to be an award of some sort. 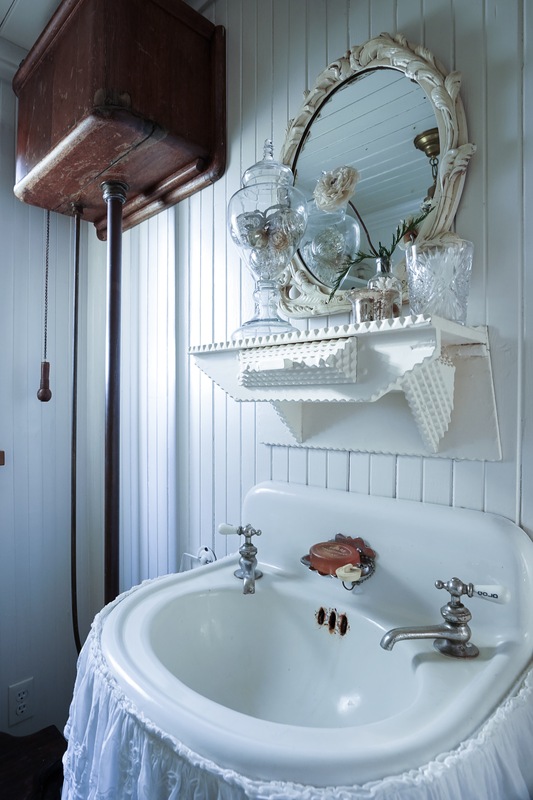 Jami traded a quilt for this antique pull chain toilet! Jami filled the clawfoot tub with hot water for our photoshoot. It fogged the camera lens, most of those photos truly ended up on the cutting room floor. 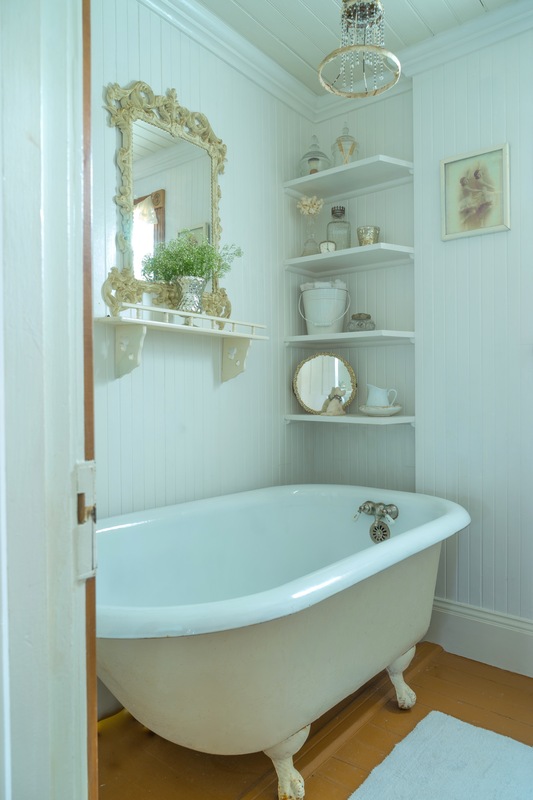 The tub was so inviting, I nearly jumped in. Look at the picture on the wall, it’s another example of Jami’s excellent sense of humor. Amy, thank you! Maybe this year, I will do a better job with your family’s Christmas photo! I miss you and love you, too!